It is sad to see US net neutrality repealed as only internet service providers will benefit, says Katy Anderson, Net Neutrality campaigner. The rules are a way for the government to control the content, argues Chris Kitze. 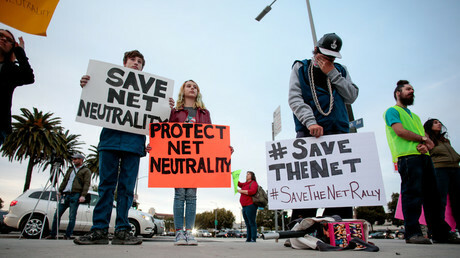 The US Federal Communications Commission (FCC) voted on Thursday to eliminate net neutrality protection. Net neutrality means internet service providers must treat all data on the web equally, regardless of the content, website, platform, application or method of communication. The FCC says net neutrality is preventing websites from investing trillions of dollars in network services. 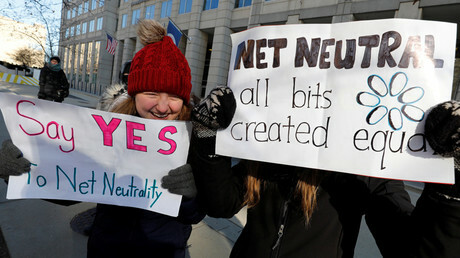 However, it is feared that with net neutrality regulations gone internet service providers will charge extra to prioritize traffic, effectively creating a ‘slow lane’ for smaller websites. RT discussed the possible consequences of the decision in regards to the freedom of the internet with Chris Kitze, founder of “Unseen,” a company providing secure communications, and Katy Anderson, the director for the Net Neutrality campaign. RT: Could you give us your insight on what this ruling on net neutrality will mean, in practice, for ordinary internet users? Chris Kitze: Let’s look at what happened before they had these net neutrality rules – they had no rules. And the internet did just fine. And then they imposed these rules under President Obama, and now they are getting rid of these rules. Why did they want to impose these rules? If you look at the people who benefited from having everything equally carried – if you are Netflix and you are literally consuming one-third of the internet bandwidth, and you want to be charged the same as some small website to deliver their content, of course, it makes sense. That is why those are the people who are in favor of net neutrality. What they did is they dressed it up and tried to put it in the class warfare, the kind of communist things that you hear about from a lot of people who are in favor of a lot of regulations. And what happened is that they just swept it away. It is actually a very good day for the internet, I think. RT: The FCC is controlled by Republicans. Why is scrapping net neutrality so important for the Republican Party? What are they gaining by it? CK: I don’t look at it politically. I don’t get politically motivated. I just believe in freedom. And the problem with net neutrality is that it is a way for the government to come in and regulate and control the content that is going through the pipes. That to me is the real issue…If you look at Google and Facebook, they are controlling the access to a lot of content, [if] you look at Netflix – all these different large Silicon Valley companies have controlled the dialog, they are the once who are behind this net neutrality. And this is in effect, something from Donald Trump going against these big companies, who by the way, did everything they could to keep him from being elected. RT: Is this the end of the open internet as we know it, essentially equality for all web-users? Katy Anderson: We’ll see. The vote is definitely a step in the wrong direction as it repeals the 2015 order that put in force these net neutrality protections. It is sad to see, but I hope, we’ll see Congress in the US repeal it. We already had five Republicans come forward as well as a slew of Democrats. Hopefully, it is something that we will see overturned over the next coming months. RT: What does it mean for the average American? KA: Over the past 20 years we’ve seen the internet where all content was treated equally. It doesn’t matter what news website you want to see, it doesn’t matter what video content you want to see – the internet service provider treats it exactly the same, and they can’t charge a content producer more money to actually get in front of consumers… What we will see is that internet search providers can charge more for some companies to get in front of consumers faster or completely block other companies that don’t pay. For consumers what that can mean that prices could go up as their favorite service providers are forced to pay more or that their favorite websites could get blocked. RT: Who will benefit from the absence of net neutrality? KA: Internet service providers. The people that control the networks right now are the ones that are going to benefit. They will be able to charge more and just have more control. And those billions of dollars industry will have even more control of what you and I see and do online.